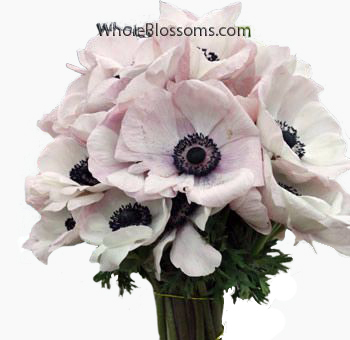 Anemones are excellent flowers for arranging centerpieces and bridal bouquets. They are the flowers referred to as “lilies of the field” in the Old Testament. They are cup-shaped flowers in rich jewel colors. The centers are pale green or black with 2 to 3.5 inch heads. 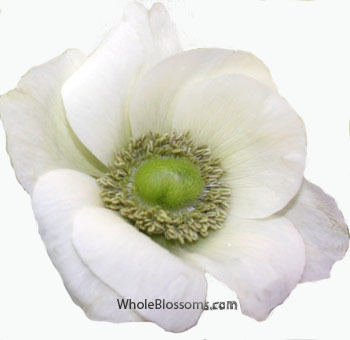 A fresh anemone has a tight, clean center. As they get older the petals are slightly faded in color and have become separated more from another. They will open in the light and in a heated environment, and close in the dark or in cooler temperatures. They will also curve or bend toward the light. Keep them in medium light and in a cooler spot to prolong life. 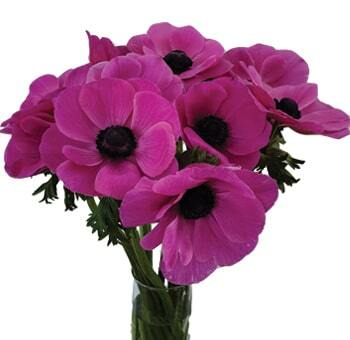 Our anemones come in white, purple blue, pink, burgundy, and red shades. They are seasonal flowers generally available from late December to June, however, they are also offered in the off season months. Please not that they may not be available during some weeks during the summer and beginning of winter due to the weather. Every event or occasion comes to life with flowers. No matter what season it is or what type of occasion it is, flowers suit in and fit well everywhere! The feel and charm of any celebration double up with the right flower arrangements. The colors of the flowers and the types of flower arrangement have a great significance for every event. Make sure you get it right! 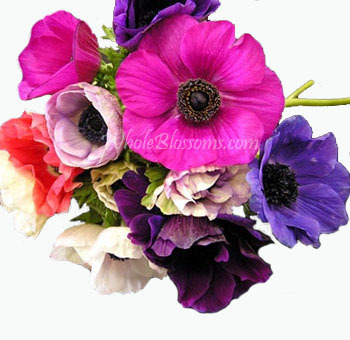 Anemone flowers are the type of flowers you would employ for an occasion that is happy and bright. Being brightly colored, they add playfulness and elegance to the décor at the same time. Generally used in flower bouquets or garlands, they work perfectly for outdoor decors. The beautiful bloom isn’t very hard to find. Make it a part of your celebration and add grace to the venue. Being one of the simplest varieties, they are not very expensive and look beautiful too. These silky flowers get their name from a Greek word which means 'windflower' as they are light and get blown away by wind easily. They are also known to blow the minds and hearts away of people with their beauty. These beauties are known to be the flowers of God as they are considered auspicious. These flowers are generally found in the Himalayan regions. 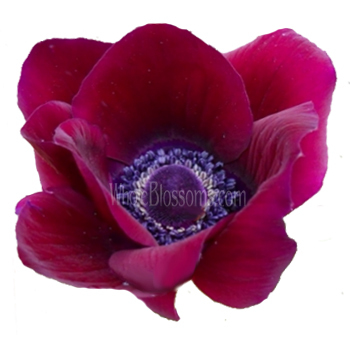 The perfect anemone flower season is the season of flowers, spring! The bloom of this flower is medium sized and daisy-shaped. The petals of these flowers are delicate and feeble. Being moderate in size, these blooms look better when used in bulk or clusters. These petite blooms bring grace to your occasion with their appearance. Make the celebrations more meaningful with these lovely flowers. These daisy-shaped blooms come in a wide range of varieties. Hollandia, the bright red anemone flowers with a white eye in the midst of black center are amongst the most popular ones. Mt. Everest, a variety with double white flowers and a light, bright green stamen looks just perfect for a beachside wedding! 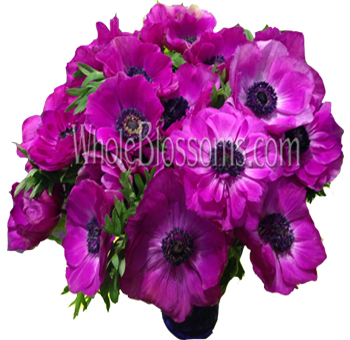 If you are looking for violet colored blooms, go for Mr. Fokker, the anemone flower variety with deep violet colored petals and black stamen part to it. 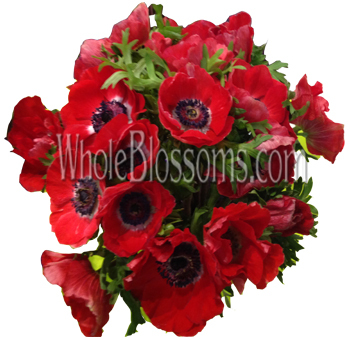 Paired up with good foliage, these blooms give a feel unmatched to any other flower! These soft blooms look incredibly exotic and ornamental in appearance. Be it an elegant affair, or something with a bohemian look; they work perfectly for any decor! They are found in beautiful bright and contrasting colors like white, purple, blue, red which strikingly stand out and outshine the venue. 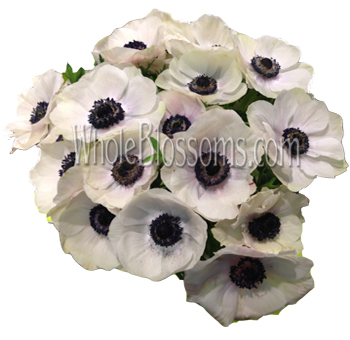 The white anemone flower or the pink anemone flower is highly popular for flower arrangements among the florists. Their velvety petals and soft structure make them perfect to express all emotions, be it love or happiness. Having darker, a pigmented portion in the middle, the flowers have a different combination within themselves. Having relatively brighter appearance, these blooms look ravishing for day-time affairs' décor. Pair them up with lush greens; they complement each other the best. These colorful flowers look great with lilies and roses too. Or, pair them up with any tropical blooms and they will enhance the look of your venue. These flowers are used in bulk when it comes to wedding flower arrangements and décor. Being pretty and moderately sized, they are a big hit among girls looking for the perfect flowers for their big day. Flower arrangements centerpieces look amazing when made with these radiant, fresh anemone flowers. Wedding centerpieces could be made by pairing up anemone with roses and a few greens. If it is an evening affair, add a few candles in the décor with anemone to make it look more beautiful. You could employ these beautiful blooms for baby showers too! Add happiness to your celebration with these colorful flowers. Having a playful feel to them, they look very graceful with water also. You could consider using them as floating flowers in water. 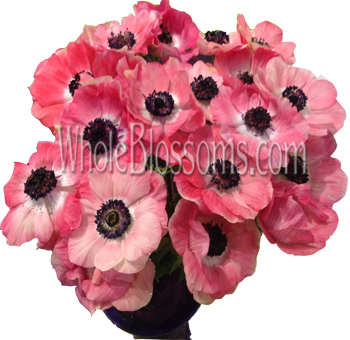 Where to buy anemone flower wholesale? Purchase the most exceptional quality of flowers online now! No more hassles of visiting the market in search of fresh looking flowers. With online flower selling stores like Whole Blossoms, your job has been simplified. All you need to do is go on the website and pick your favorite flowers for the occasion. Just with a single click, place an order of the blooms you like. Get the freshest quality of these blooms delivered to your doorstep whenever you want. 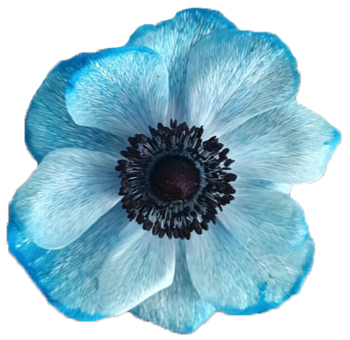 The anemone flowers for sale are available at the best prices on this site too. When it comes to purchasing budget-friendly flowers for your arrangements, Whole Blossoms is the best place you can go to! 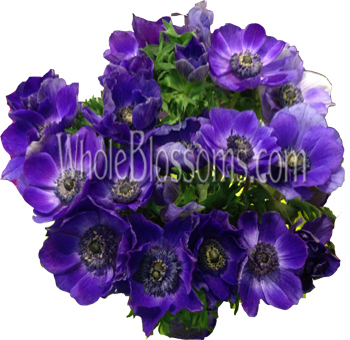 Just place an order for these anemone flowers on their website. Get them delivered at your doorstep, at your convenience.